We will be launching our new Brainy Actz Laser Maze experience nearby in Temecula, California! You better tread carefully – this exciting, new attraction is taking the world by storm with its highly immersive, interactive gameplay. Using agility, quick thinking, and speed, players must avoid an array of laser beams to complete their objectives. Enjoy navigating through a seemingly endless maze while being engulfed in a web of laser beams. Test your hand-eye coordination skills in a game that’s easy to pick up, but challenging to master. Race against your family and friends but – be careful not to get hit or else you’ll have to start all over again! Does the spy in you have what it takes to complete your mission and escape the maze? Enter if you dare! 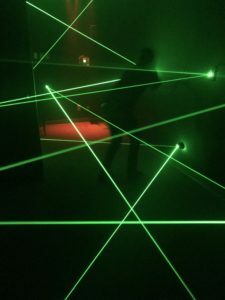 You will need to overcome the challenge of moving through our Temecula laser maze, completing your mission of escaping while never touching the lasers. It will feel like you are in a scene from Mission Impossible. Ethan, do you have what it takes?